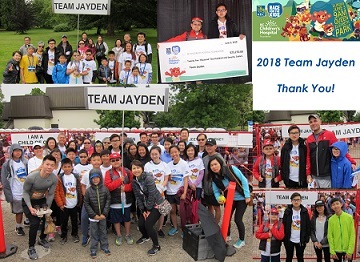 Join “Team Jayden” in our efforts to support BC Children's Hospital Foundation! Jayden was diagnosed with leukemia on June 30, 2008. With the excellent care from BC Children’s Hospital, Jayden completed his three-and-a-half years of treatment in October 2011. This past October marked his 7th anniversary of completing his chemotherapy treatment. Jayden, now in Grade 12, is focussed on completing his last year of high school with excellence and is looking forward to the opportunity to study Behavioral Psychology in a post-secondary institution close to home. Jayden continues to enjoy playing music in his spare time. This year is the 11th year that our team is participating at this fun-filled and meaningful event. Thanks to the support from family and friends, our team was able to raise a total of $166,830.50 in the past 10 years. Please join our team to raise funds for childhood cancer and mental health initiatives at BC Children's Hospital. Your support and contribution are greatly appreciated. Thank you!! !